Here's another little organizational tip from today. Do you know Modcloth? It's a fantastic clothing company. Several weeks ago they had a photo spread on their blog and I could see that they hung up their fabric on the wall using hangers. It was so charming. I thought about doing that in our amusante room, but it didn't make sense. It DID however, become a brilliant organizational tool. How many of you have fabric buried down so deeply you've forgotten it existed? That was me. I kept it all in a tub. Bad idea. I decided to hang it on hangers in the closet and it's SO much easier to catalog and use what I have now! I took the scrap-ish pieces of fabric and set them up on a 5 layered pant rack (far right). Again. So useful. 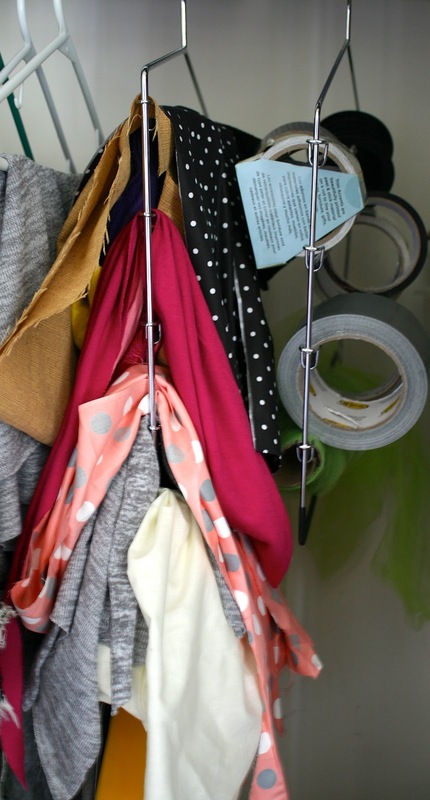 I used to use the pant hangers to store ribbon, but I moved the ribbon over to a new storage rack with TUESDAY's tutorial. I still use the second pant organizer for tape, though. Here's an up close shot of the pant hangers working their magic. Also, yesterday was take your wifey to work day for John. I blogged about how I had been running around in the Grand Rapids area all day. I went with him because I had a tattoo touch-up appointment and I didn't want to drive into GR by myself. I'm a wuss. John ended up getting a massive mural from wrist to elbow! It's themed around my favorite book that John has grown to love. I'll walk you through it. This is the beginning. He originally had a rose illustration tattooed on him with my actual signature running along it. Who is "aundrea" you ask? Well, that's my full name. John never calls me 'auna' :) It's interesting, my parents + brother have never, ever used short forms for my name either. But they're the only 4 people I know who haven't. Anyway, that tattoo is a couple of years old. He ended up leaving with all kinds of goodness! It's really sweet actually. I have the stars tattooed on one spot and one of those birds is also behind my ear with John's name. So there's a bit of a tie-in between his mural and 2 of my tattoos. John is over the moon excited, he's a tattoo junkie. I'm the only thing standing between him and a sleeve. I can't get on board with a sleeve, though. So this was a good compromise. Right now the rose looks a bit disconnected from the rest of the mural, but once it heals everything will match perfectly. If you're wondering about stars, roses, birds + planets... I can't explain it. You'd have to read the book. As for my touch up, sadly... I should have listened to my artist the first time. He warned me against white ink. I didn't listen. Even though he went over the scar tissue in a darker ink, I'm pretty sure it's still going to be invisible. It's a shame, really, because he drew me the most beautiful peony you've ever seen. If you click on the picture and blow it up, you can kind of get a glimpse of the greatness. If it doesn't heal darker, I'll have to go for a round three. I hate to even ask him to do the same tattoo three times... all because I didn't listen to him. So, maybe it'll be a lesson learned and I'll just have to keep sporting a wedding ring! Well, you are "lucid" as the little prince would say :) glad to have a friend who gets it.